BAD pitches, teams playing two banks of four, questionable refereeing and the opposition up for a scrap and maybe a scalp - how Hibernian yearn to get out of the Championship. This dreary draw had been preceded by Hampden semi-final cup success and a home win over Rangers, two games where there was plenty of room for Alan Stubbs’ men to express themselves. But when grind comes after glamour they must deal with it better than they did here. It began like a typical end-of-season game in the spring sunshine – bumpy surface, leisurely passing, reticent shooting – but Hibs couldn’t really afford one of them. This was an opportunity to exert some pressure on play-off rivals Falkirk before their tea-time kick-off at Raith Rovers. The woozy first 15 minutes couldn’t match the build-up to kick-off for intrigue. That was when the Cappielow DJ rolled out his lengthy Prince tribute. Which hit would be next? Ah, Diamonds and Pearls. At least after that the game stirred from its slumbers. Morton’s Mark Russell drove from 25 yards and Mark Oxley palmed away. And then Liam Henderson for Hibs – playing in Princely purple – ran on to a Fraser Fyvie chip but he couldn’t get his effort over the advancing Derek Gaston and under the bar. No diamonds, no pearls, but at least it was something. Morton’s surprise 3-0 win at Easter Road in the last round of fixtures had been the start of Hibs’ problems, with the team not winning two in a row again until last week. Thomas O’Ware, a scorer that night, was a forceful presence in their midfield yesterday, although Hibs’ Darren McGregor matched him for muscular challenges. The problems for the Leith team were further up the park where the midfield struggled for fluency and the strikers were forlorn. Morton were playing for pride, fifth place and to finish the best of those outwith the play-off spots. And with Falkirk to follow in their last match they were certain to have an influence on the final placings. They made it difficult for Hibs by getting everyone behind the ball and the lack of atmosphere won’t have helped their cause but couldn’t be used as an excuse. Morton obviously know Cappielow’s strange contours best and right after the re-start Joe McKee demonstrated you can still pass with zip across this surface and, with the return, almost find yourself with a sight of goal. Cummings finally spied an opening only to blast wildly over the bar. Anthony Stokes was more accurate from 20 yards, Gaston tipping it behind. In the space of five minutes we’d already seen more action than the whole of the first half and it kept getting better, or slightly less worse. 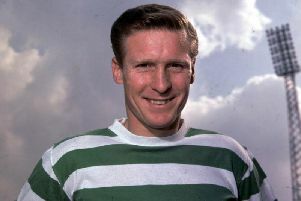 Stubbs had a full and frank exchange of views with the referee and then came the offside decision as Cummings curled a sweet left-foot shot into the top corner of the net. Then Morton thought they’d scored. Ross Forbes’ hopeful through-ball was missed by Niklas Gunnarsson, letting in Robert Barr who shot through Oxley’s legs only to see his effort bounce off a post. “We were a bit unfortunate with that one,” Morton manager Jim Duffy said, “but put a point against Hibs into perspective: they’ve reached two national cup finals and have every chance of winning promotion.